New Orleans has numerous museums, and many antiques stores. And then, there’s M.S. Rau Antiques, which has a museum-worthy collection — but it’s all for sale. Bill Rau is the third generation to run the French Quarter landmark, which opened in 1912. Max Rauchewerger came to the U.S. from Southeastern Europe, arriving with $8 in his pocket and sponsorship by an uncle who lived in New Orleans. He worked for his uncle for four years and saved $500. He used $250 to start his own business, M.S. Rau, and set aside the other $250 in case it failed. “Obviously, it didn’t fail,” Bill said. The store was originally on the 700 block of Royal Street, then in 1931 it moved to 630 Royal, its current location. Sons Joe and Elias Rau continued in the business, with Joe taking time to serve in the Coast Guard during World War II, seeing action in north Africa and Italy. Elias worked at the Higgins Shipyard while also managing the store. After the war, a second story was added to the store, and Elias’ son Jack and Joe’s son Bill became part of the business. Max died in 1964, when Bill was five years old, so he does not have business-related memories of his grandfather. Max’s wife, Fanny, worked at the store well into her 90s. She died in 1989. Elias took over as president after Max died, until he retired in 1995. Bill then became president. The Toulouse Gallery added 5,000 square feet in 2001, as M.S. Rau became much more global with its website and marketing in national publications. Bill figured Jack’s son, Steven, would be the next generation in the business. But over 20 years ago, Steven said he wasn’t following in their footsteps. “I was going to argue with him,” Bill said, figuring he could convince him this was more important than being just another doctor or lawyer. Instead, Steven surprised him by saying he was going to become a rabbi. Since 2002, Steven has been director of lifelong learning at The Temple in Atlanta. Katrina, of course, took its toll in 2005. Joe and Jack lost their homes, and while the gallery had minor damage, the warehouse was flooded. A New York friend offered temporary gallery space until they could reopen in New Orleans. After the storm, Jack moved to Atlanta, and Joe moved to California. In 2011, another annex, Le Salon, opened, and Bill’s daughter Rebecca became the next generation in the family business. While M.S. Rau is considered one of the leading fine art galleries in the world, Bill can’t imagine that his grandfather was that familiar with fine art and antiques at first. “He was raised relatively poor in the middle of nowhere. There’s no way he could have been exposed” to such things. Many items in the gallery are being sold there for the third, fourth — even fifth time. Often, pieces that were purchased there return as estates are liquidated or homes are downsized. Many furniture pieces are quite unusual. Currently, M.S. Rau has a mahogany bedroom suite that used to belong to King Farouk of Egypt. There is also a cabinet celebrating Louisiana art and industry, carved from solid walnut for display at the 1904 World’s Fair in St. Louis. Desks, armoires and sideboards stretch the boundaries of creativity. A Hupfield Violina is among the more unusual pieces — think of a self-playing piano, then add a self-playing violin. Chagall, Rockwell and Monet are among the many artists whose works adorn the walls of M.S. Rau. Rockwell’s “The Golfer” was a never-published cover for the Saturday Evening Post, deemed too impolite to use. Many of the highest-end treasures are in the three-level “secret room,” behind a mural that turns out to be a door. It was done following the January 1943 Casablanca Conference, the first war conference held outside of America, where the Allies called for the unconditional surrender of the Axis. It was also a time when the war was beginning to finally turn in the Allies’ favor. After the conference, Churchill persuaded President Franklin Roosevelt to stay and go to Marrakesh with him, and they spent the evening together overlooking the city. The next day, after Roosevelt left, Churchill asked an aide to bring his paints and he went back to the spot where they had been the night before, painted “The Tower of Katoubia Mosque,” and sent it to Roosevelt as a gift. There are exceptions, he added. He regrets letting a tray with the coat of arms of Moses Montefiore get away. “It was extraordinary,” he said. In 1837, Montefiore became the second Jew to be knighted in England and the first after Jewish emancipation, to give him the stature to negotiate with the Sultan of the Ottoman Empire on behalf of Jews imprisoned in Damascus for a blood libel. He also had a New Orleans connection, as the executor of Judah Touro’s will and overseer of the funds Touro left to develop Jewish settlement in Palestine. Currently, M.S. 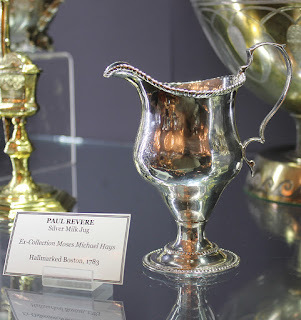 Rau has a Paul Revere silver creamer with a Jewish story. It was made by Revere for Moses Hays, “the greatest Jewish philanthropist in Federal America,” Bill said. Hays refused to sign a declaration of loyalty to the American colonies in Newport until the phrase “upon the true faith of a Christian” was removed. Hays also helped start the Masonic movement in New England and was the only Jew in his lodge. When he was elected Grand Master, Revere was his Deputy. When his sister’s husband died in Jamaica, he brought her and her children to Boston, and then raised their three children when she died four years later. One of the three was Judah Touro. The creamer was “made by an American patriot, for someone who was Jewish and exceptionally philanthropic,” Bill said. At the time, a piece like that was “extraordinarily expensive,” and he figures very few Jews in Federalist America could have afforded it. Currently, M.S. Rau is hosting “Napoleon: General. Emperor. Legend.” The show is open to the public and will be displayed through Jan. 7. It features Napoleonic art and design, and includes an original bronze death mask of Napoleon.